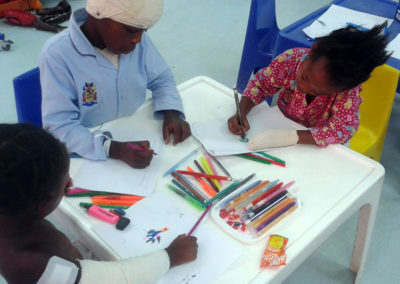 Helping traumatised, injured or sick children to express their pain and fear through creativity and play helps them to be more hopeful and happy, thereby improving their immune systems so that they can heal more quickly. 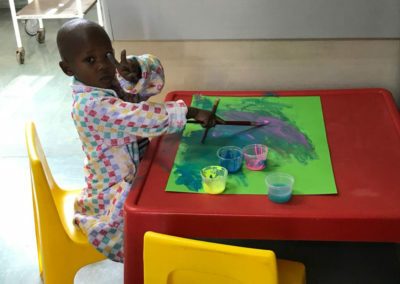 Surgeons for Little Lives sponsor Janine Rech, is an Expressive Arts Facilitator, in both the Paediatric Burns and the Paediatric Surgery Units. 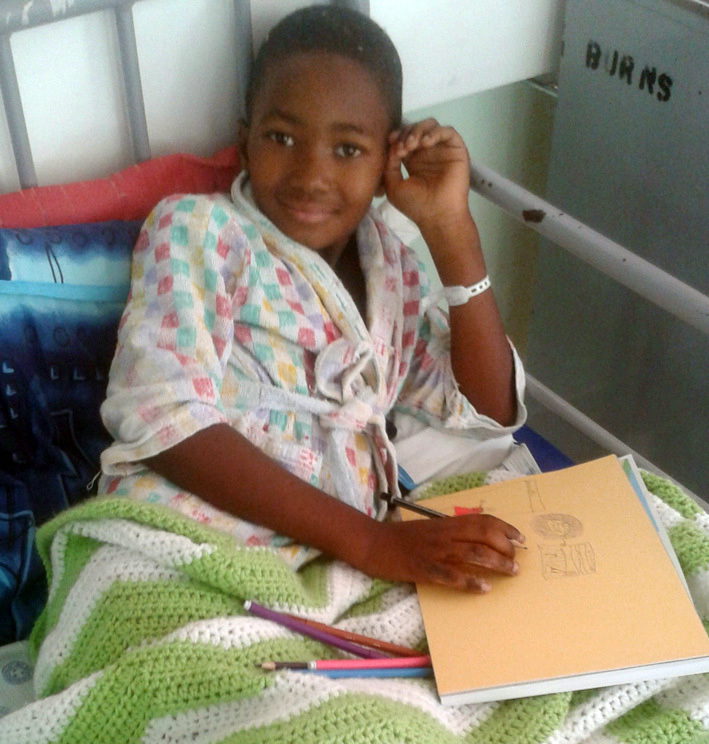 Janine has extended her services to the Charlotte Maxeke Orthopaedics wards for 2018! 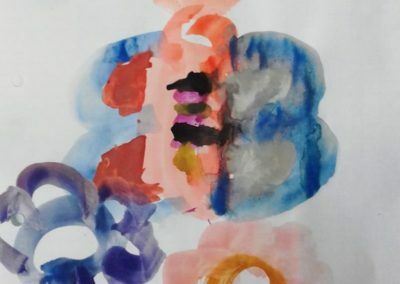 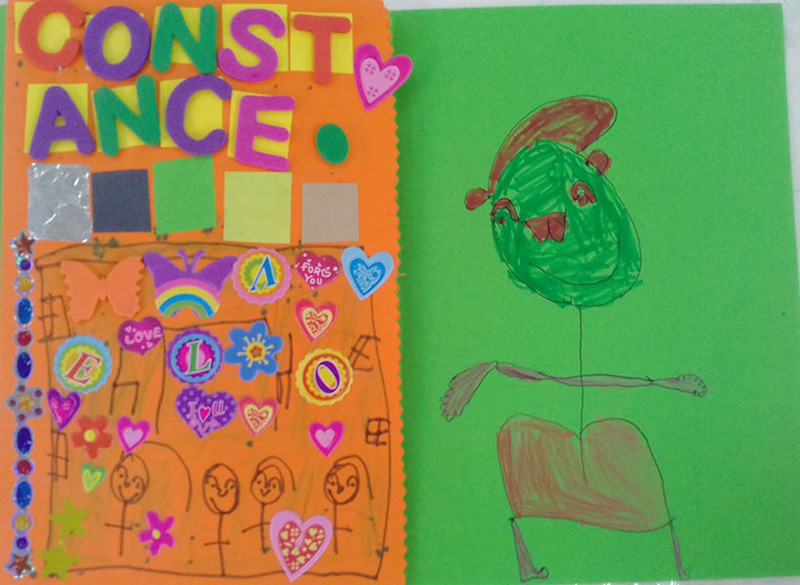 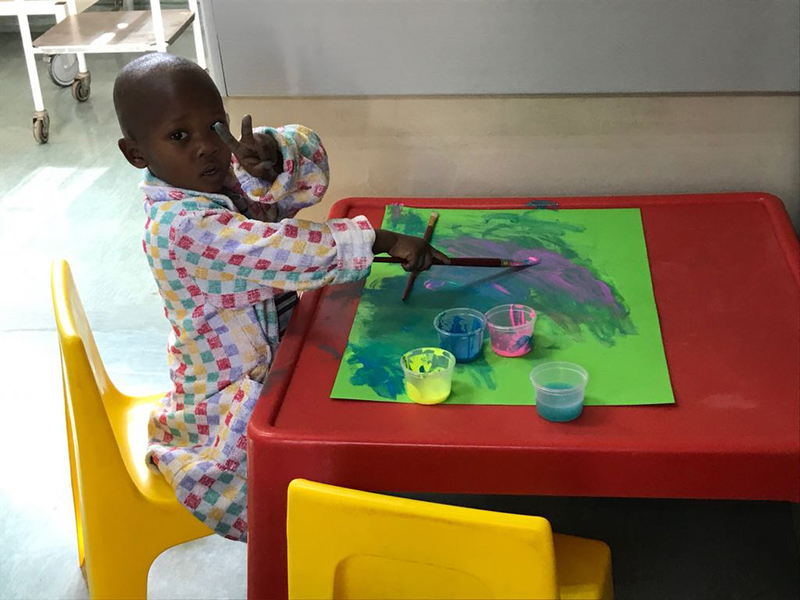 Art plays an important role in uplifting the children’s spirits and there is often an obvious improvement in a their mood and behaviour after an art session. The children enjoy painting, drawing, collaging and STICKERS! 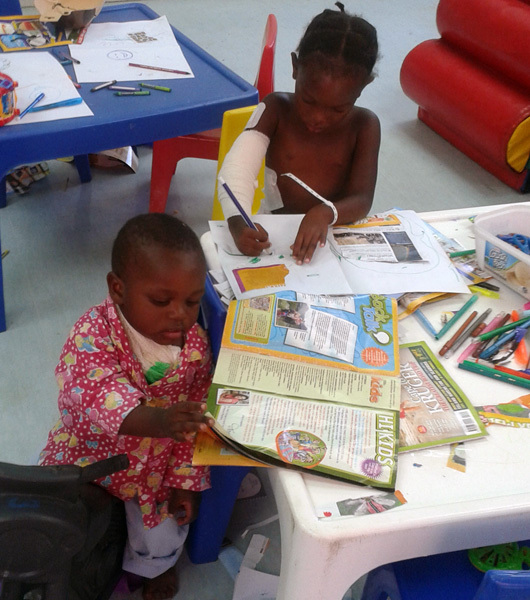 Our little patients also love music and they are encouraged by Janine to sing, move, dance and play drums. 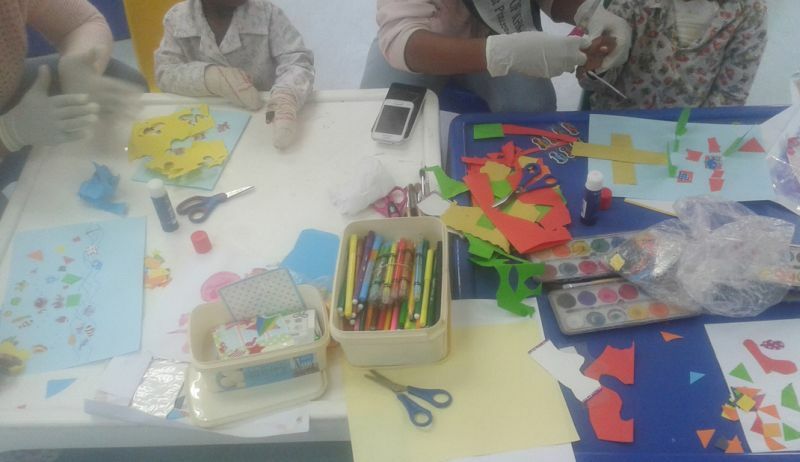 These activities help to improve both the mobility and flexibility of injured, stiff little bodies and complements the therapies that the children receive from the Occupational Therapists, Physiotherapists and nursing staff in the units. 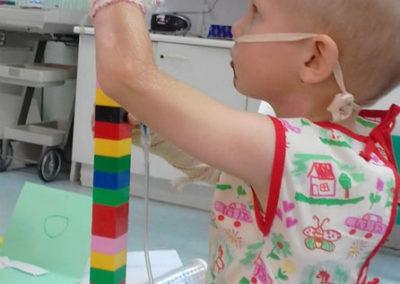 Janine also works with outpatients who have come for post-operative check-ups. 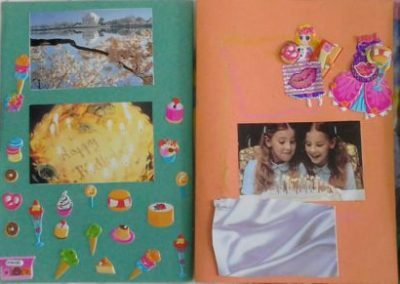 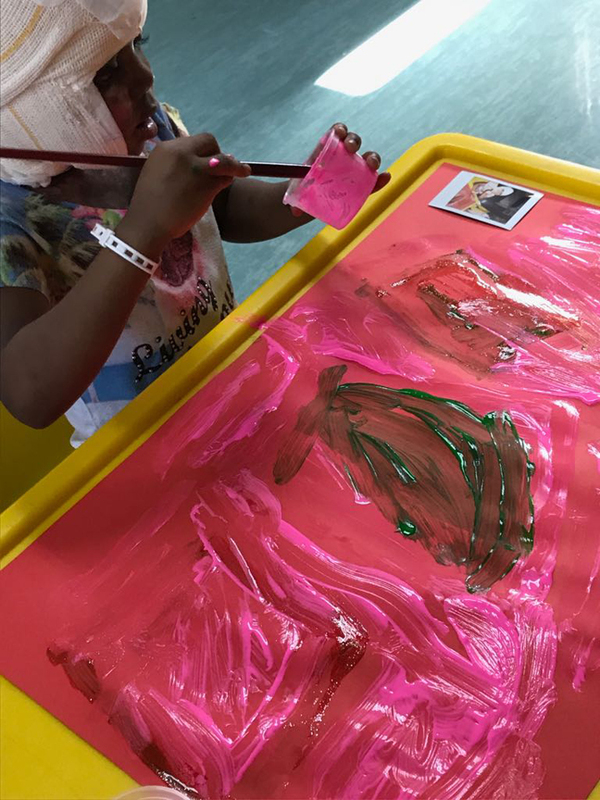 She engages with caregivers and children together, showing them how to use art at home for opening up dialogue, expression and bonding. 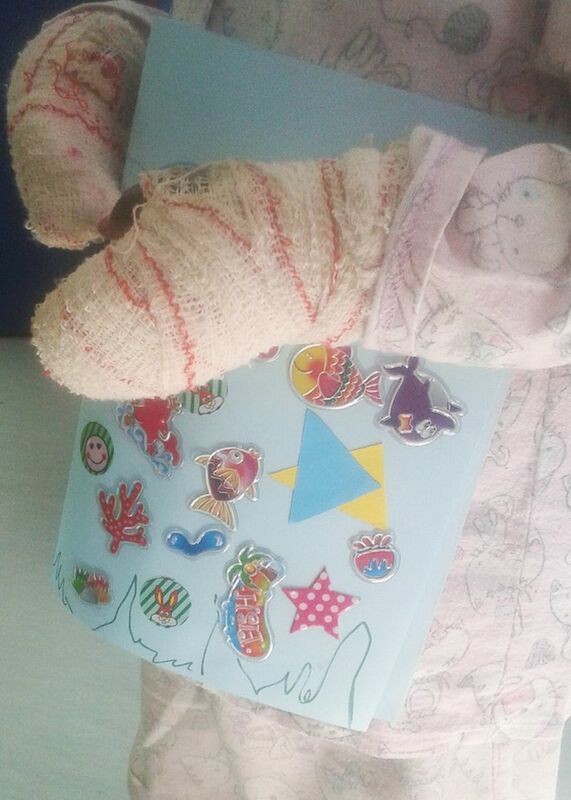 Janine’s contribution to the wards is invaluable, making very sick little patients feel safe, proud and loved. 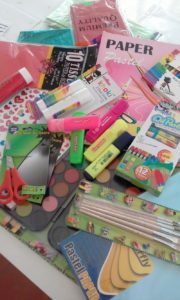 Pencils, pens, paper, coloured paper. 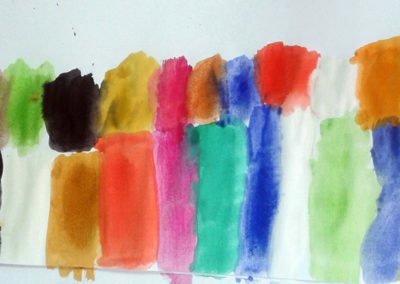 Paint sets with circles, crayons, kokis and paint brushes. 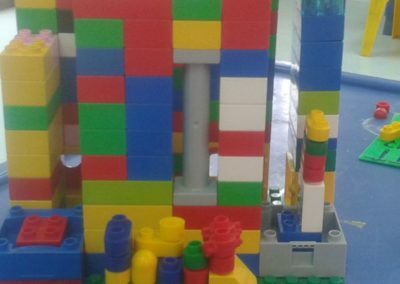 Glue sticks such as “Pritt”. 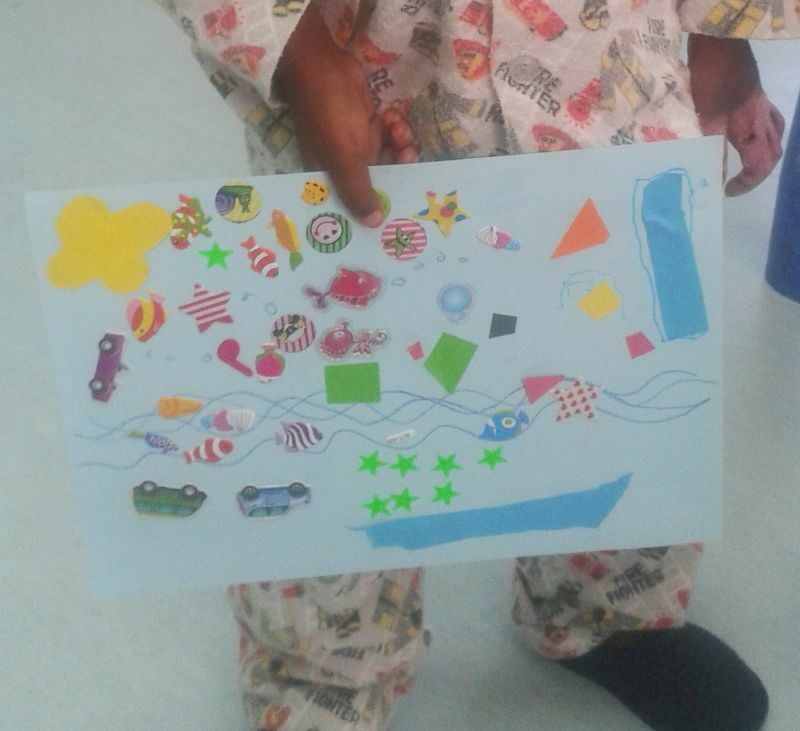 Thank you to Nadine Suttner for the donation of this wonderful art material towards Surgeons for Little Lives. 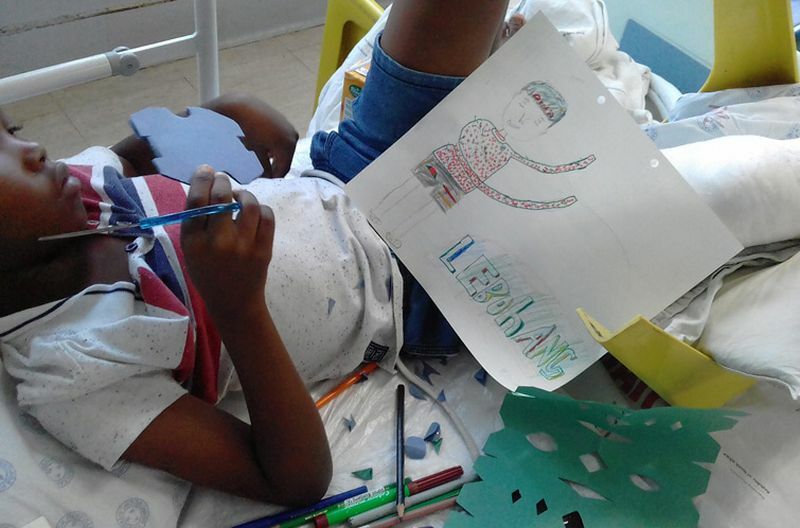 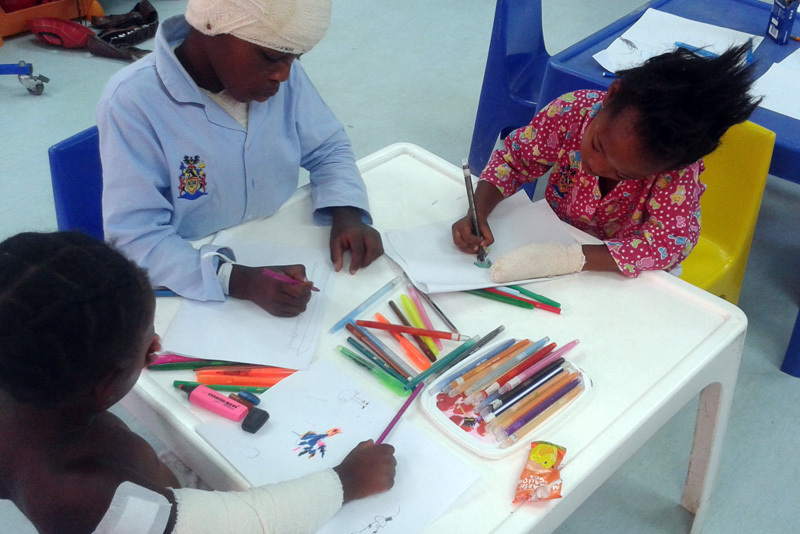 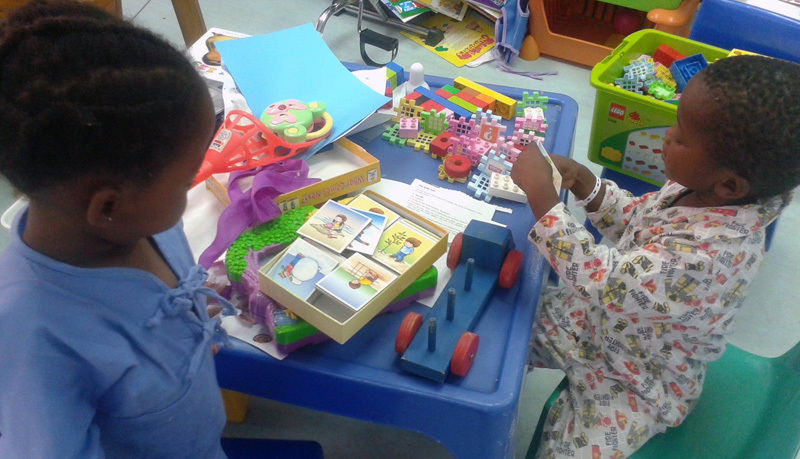 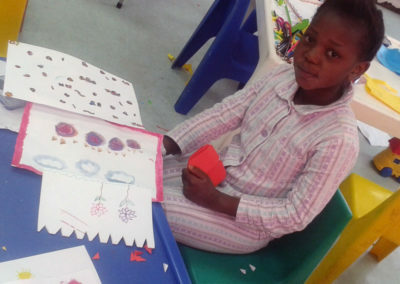 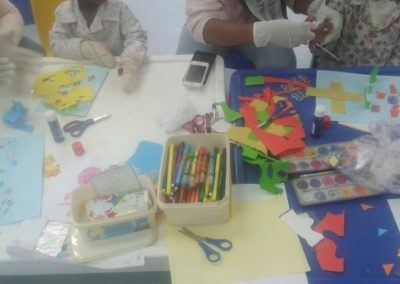 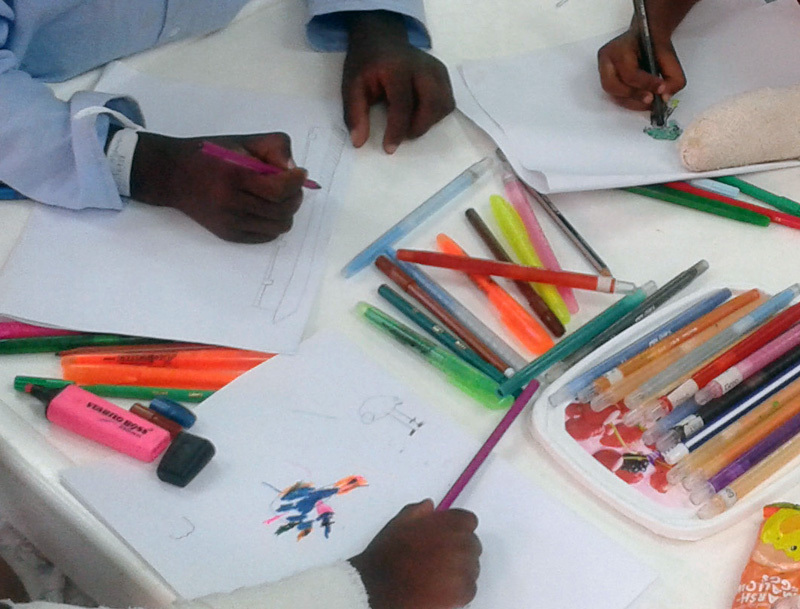 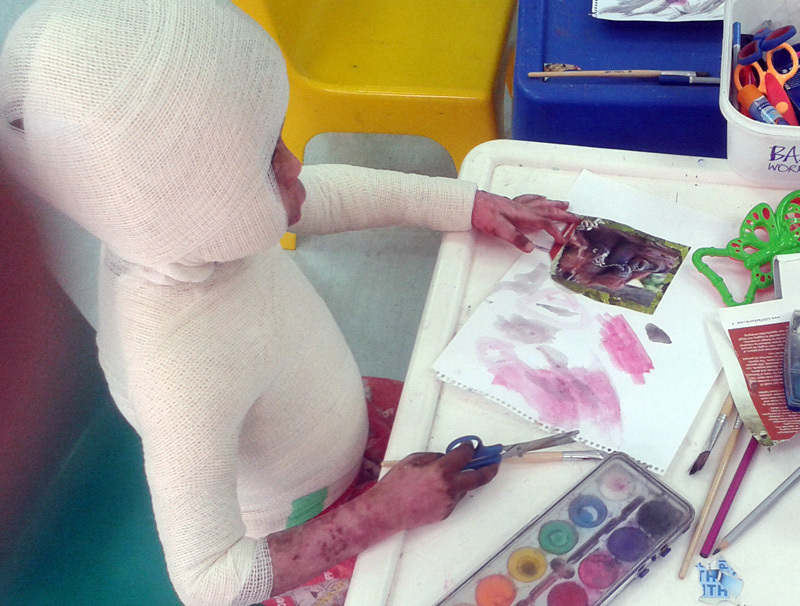 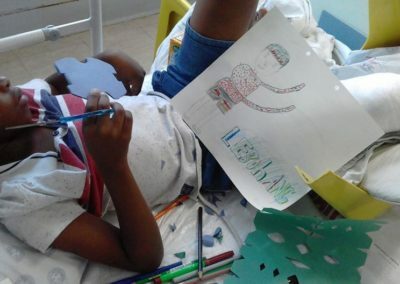 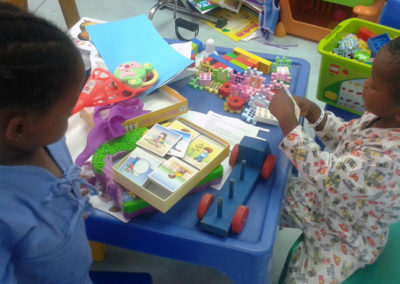 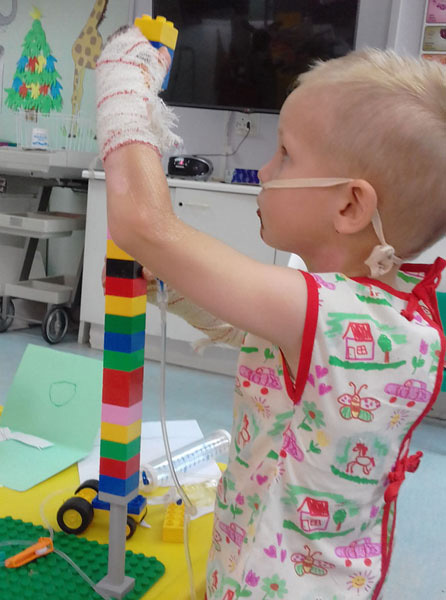 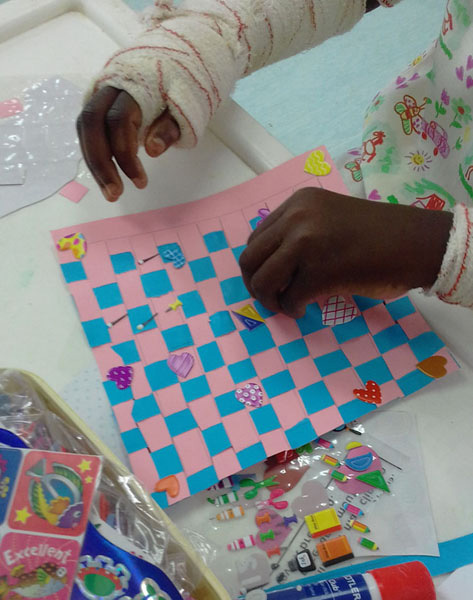 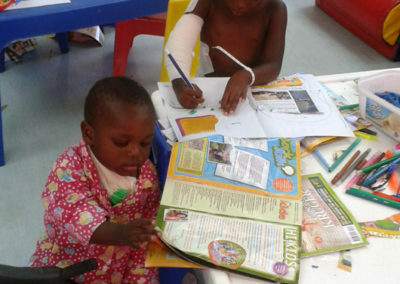 Expressive Arts Sessions continue each week at the Paediatric Burns Unit at Bara Hospital and at the Children’s Orthopaedic ward at the Charlotte Maxeke Hospital. 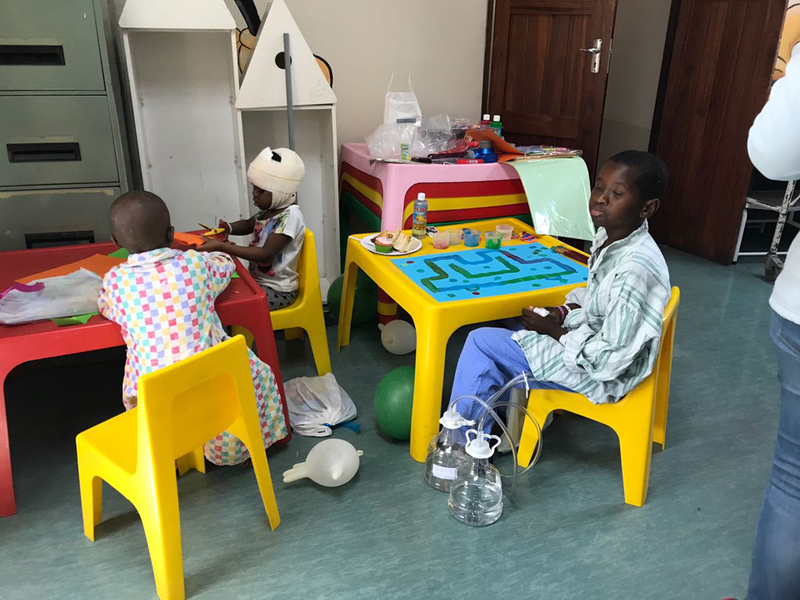 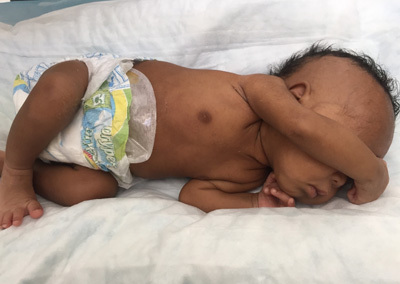 There are a lot of children needing emotional support, as well as physical support when the doctors and nurses are extremely busy with some serious burn cases and limb and facial operations. 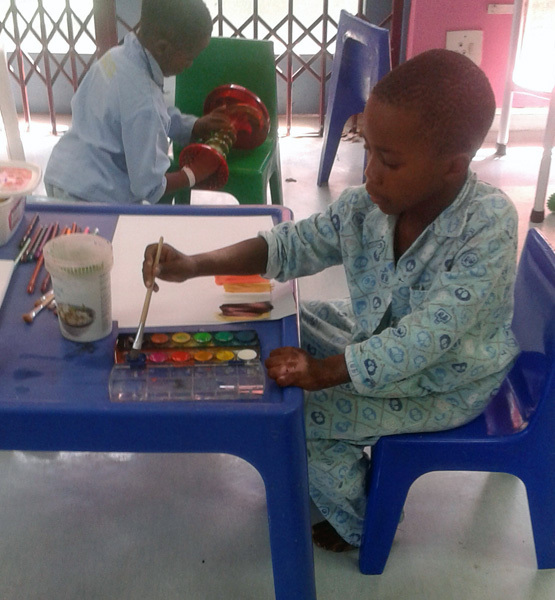 Art and play settle the children and the extra love and care make all the difference to them. 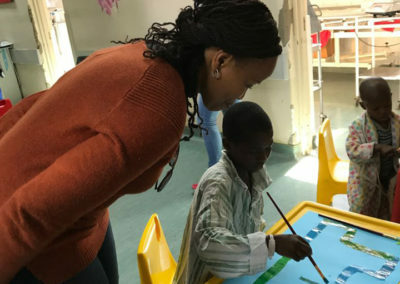 Volunteers are very welcome to join Janine on Wednesday or Thursday mornings…High school children can offer some time which adds to their community work. 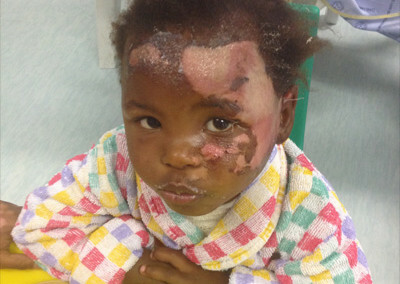 You will get a letter of acknowledgement from Surgeons for Little Lives. 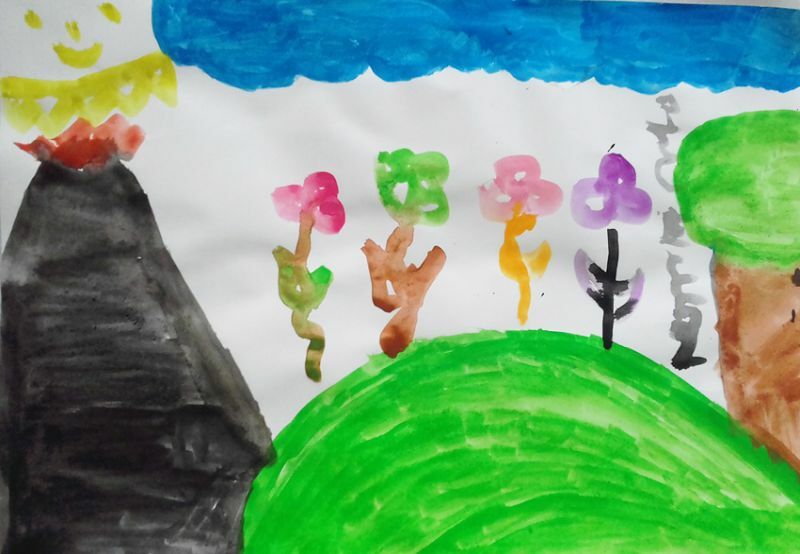 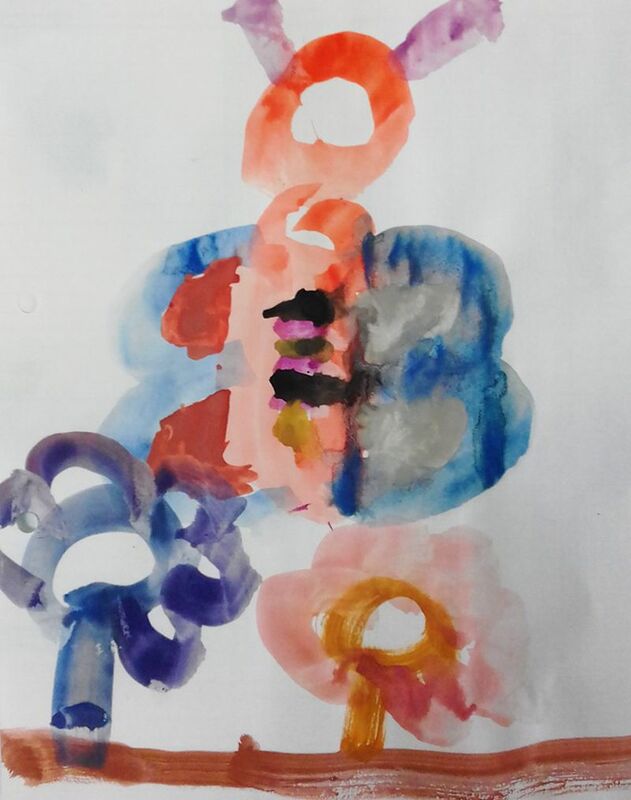 The colourful rainbow painting was done by a teenager with severe facial deformity, who happens to be a brilliant artist and future designer. 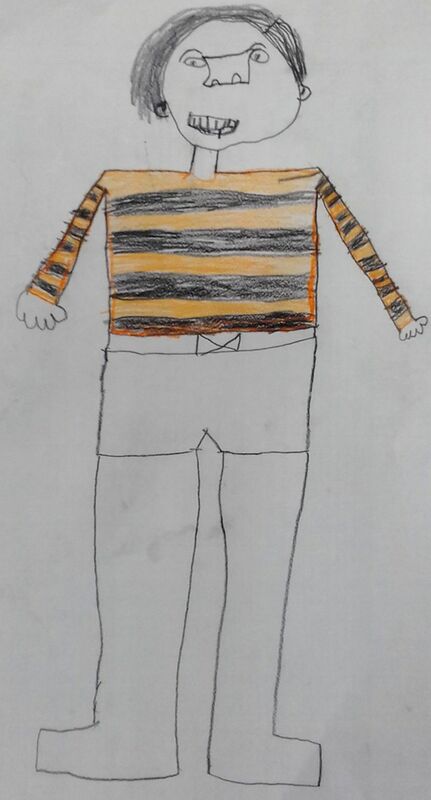 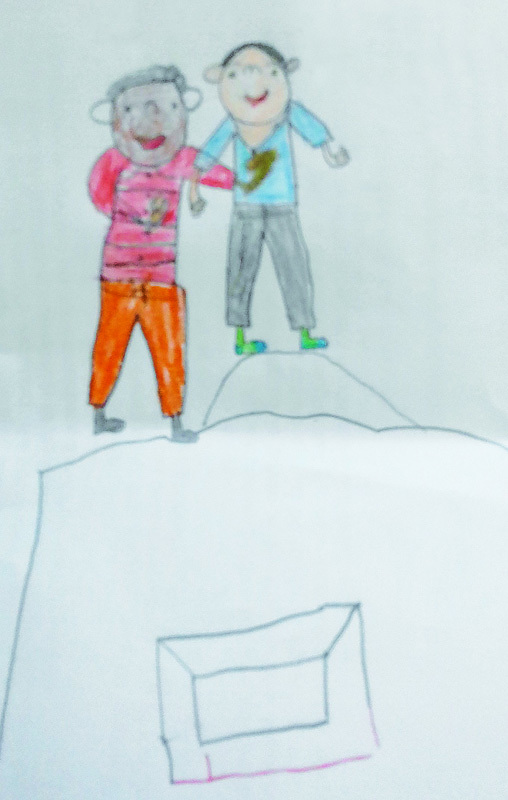 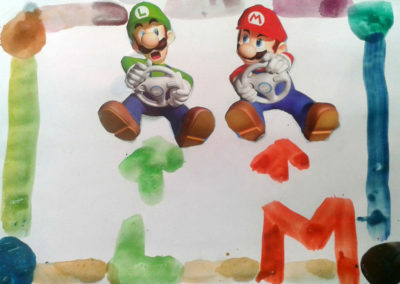 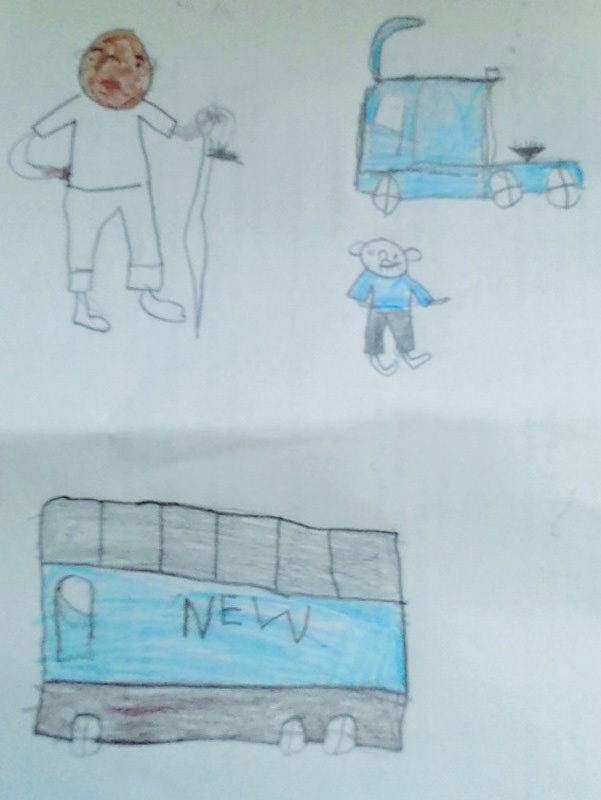 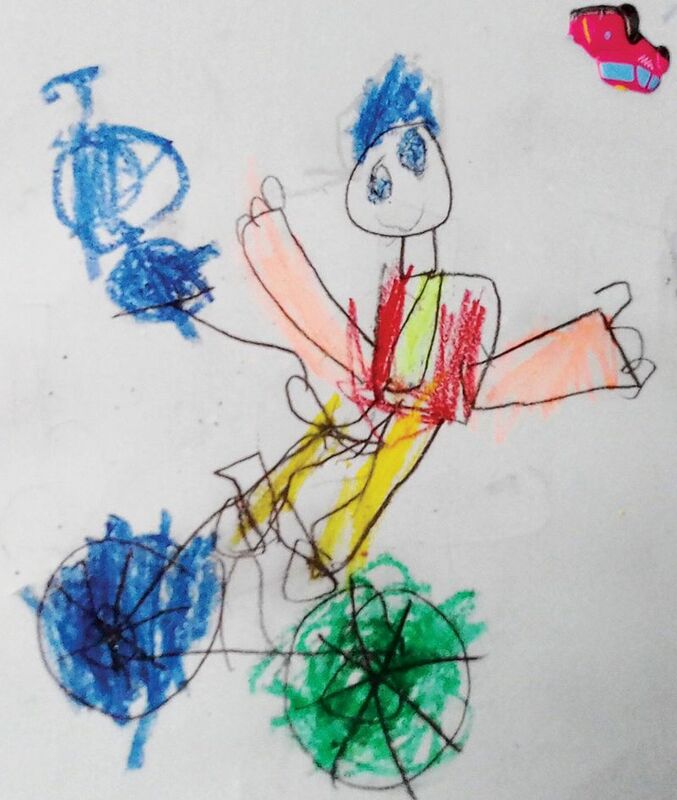 The drawings done by ‘P’, who has a leg injury, are of himself and his Dad and another of his Grandfather. 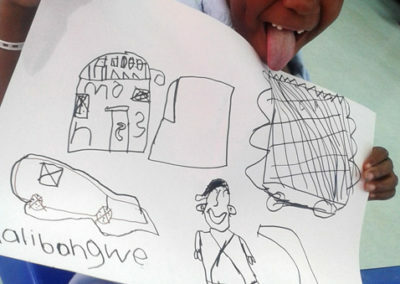 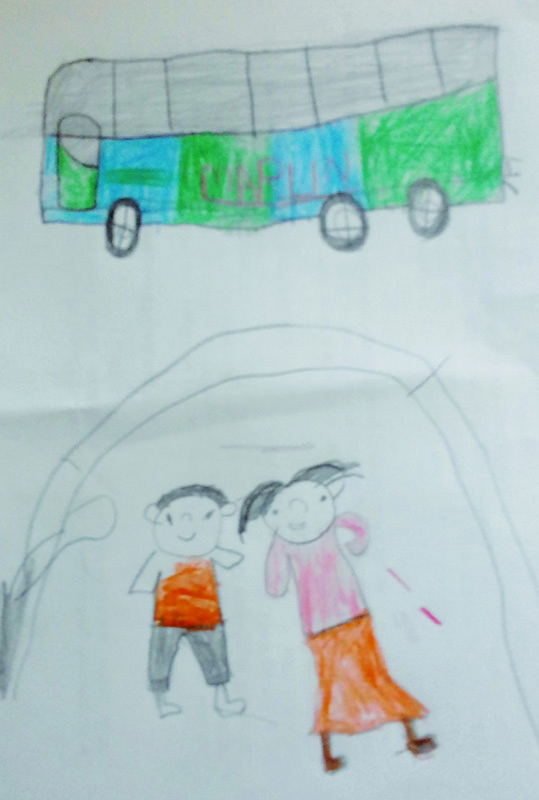 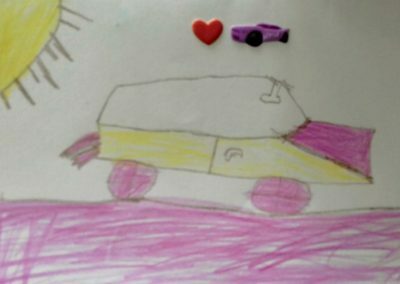 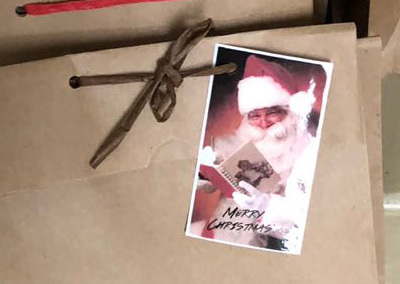 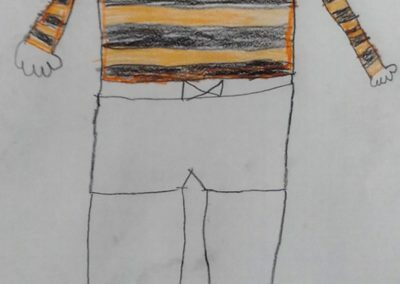 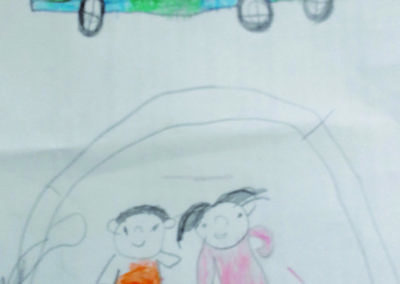 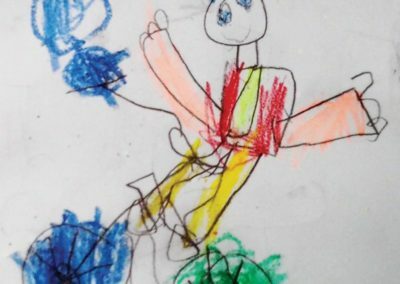 The drawing of his Mom shows that she was injured too. 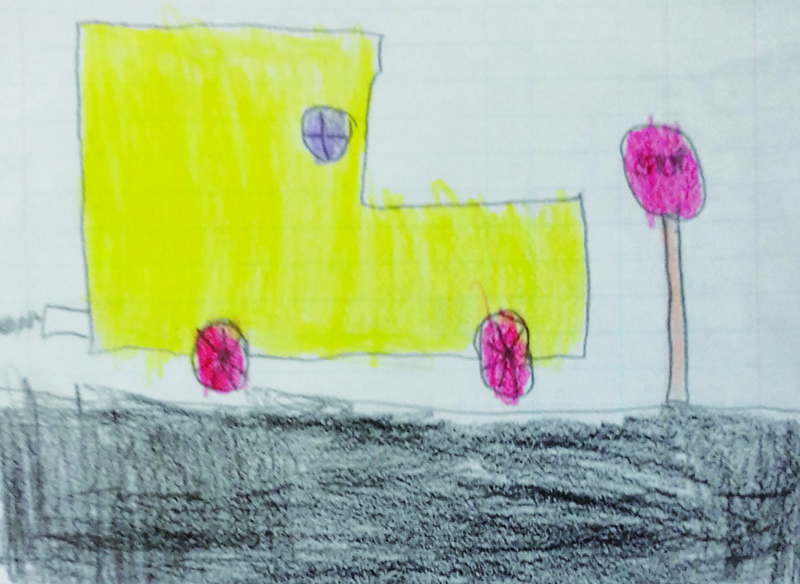 The yellow taxi was created by ‘S’, who lost half his foot by stepping on a broken bottle. 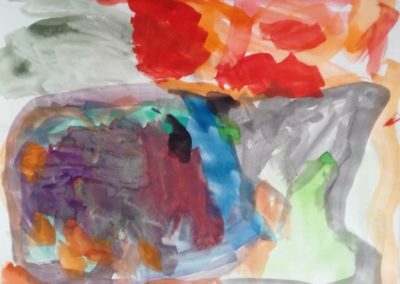 ‘S’ has done a lot of paintings and drawings in the last two weeks, he likes art, his pictures have become more cheerful with time. 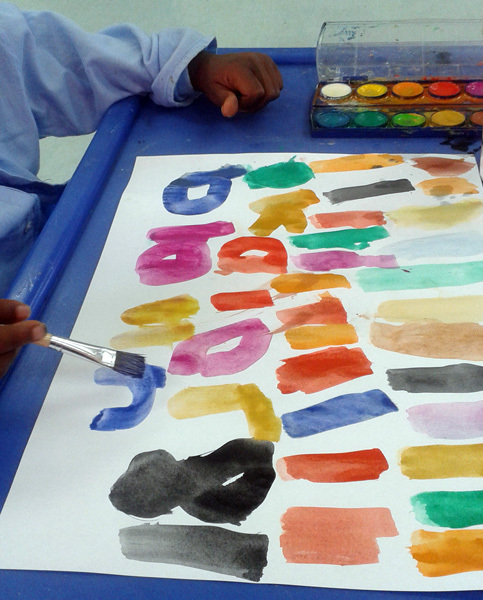 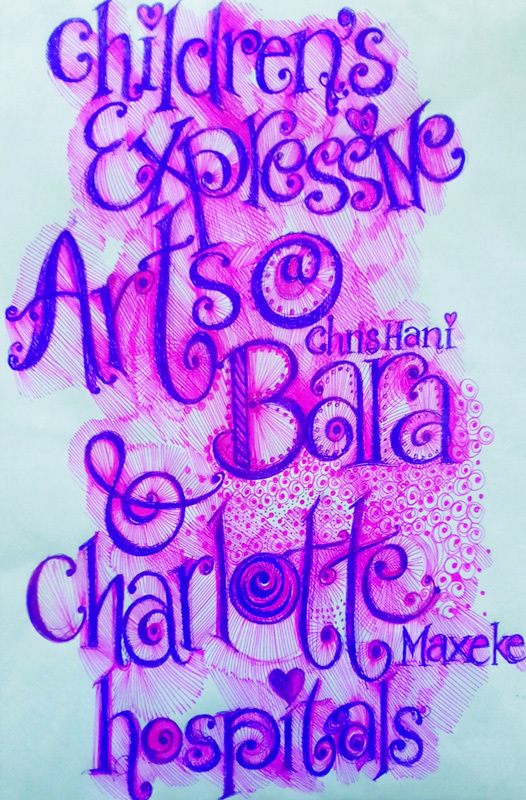 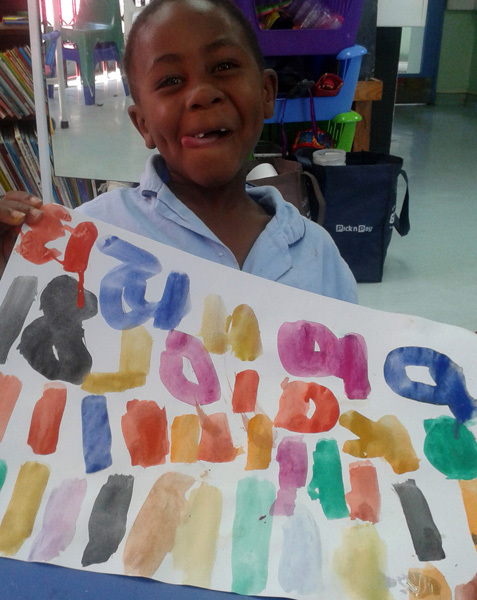 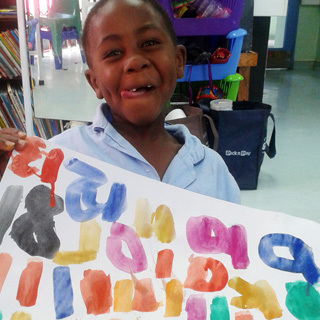 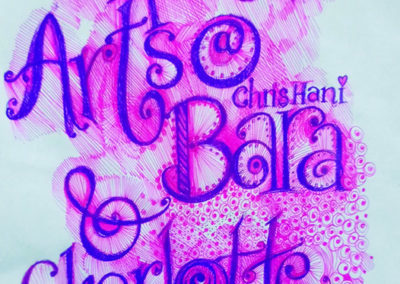 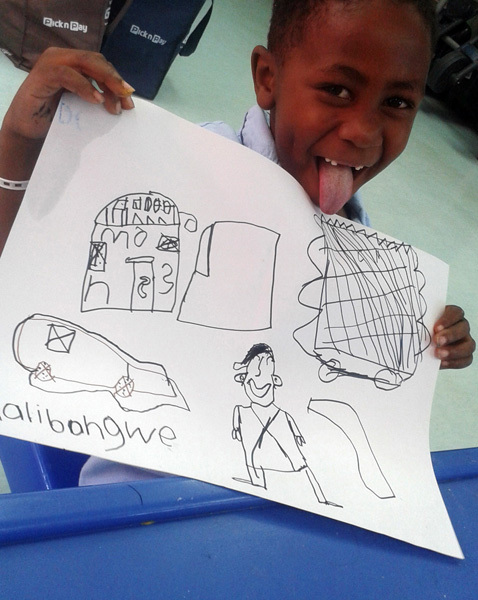 Expressive Arts Sessions take place every week at Chris Hani Bara and The Charlotte Maxeke Hospitals. 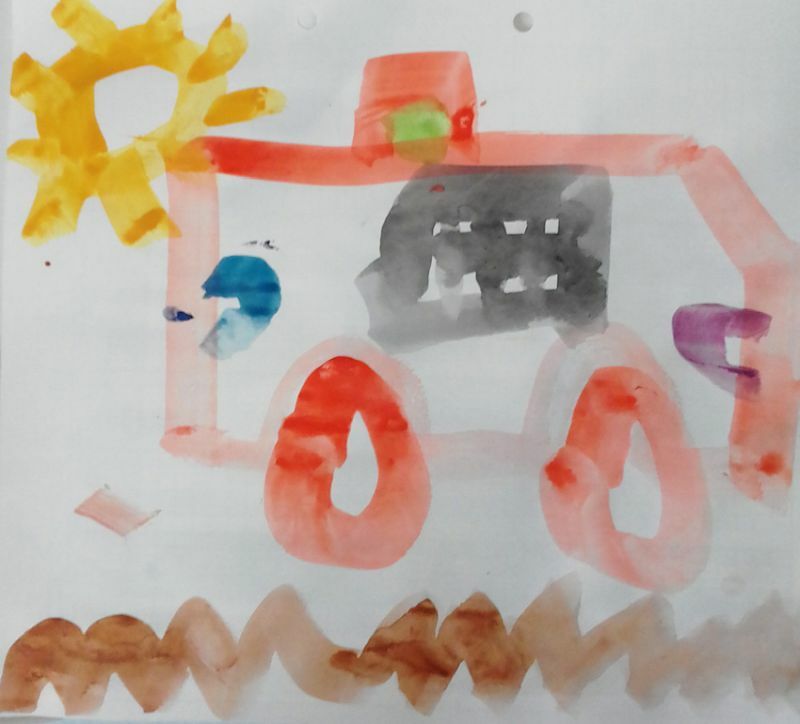 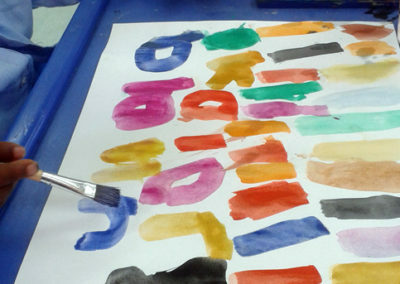 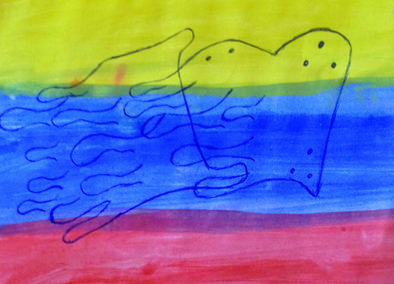 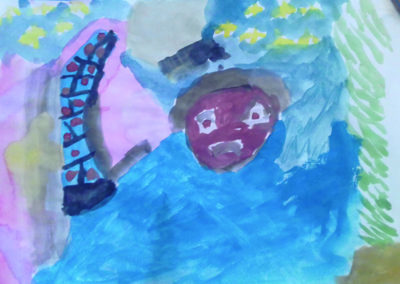 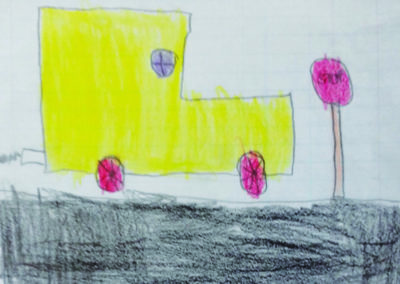 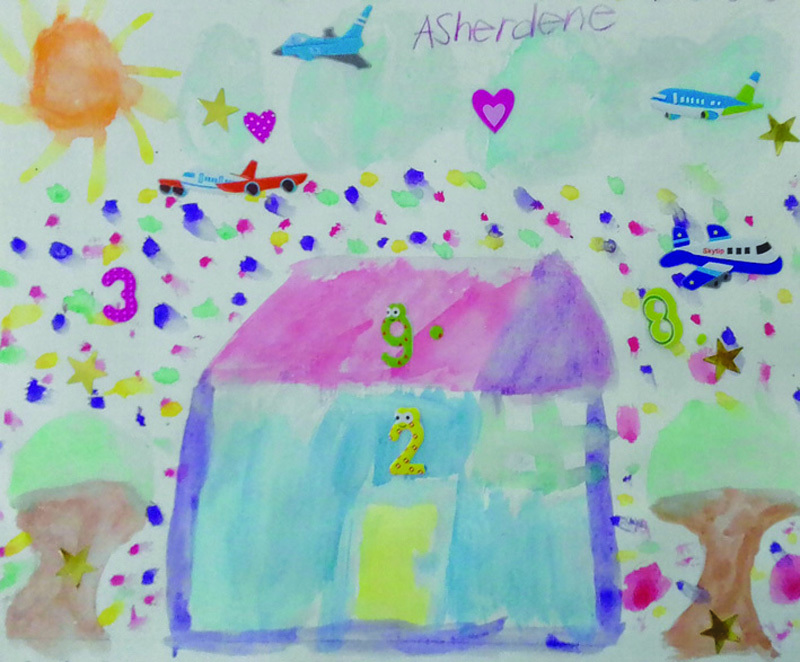 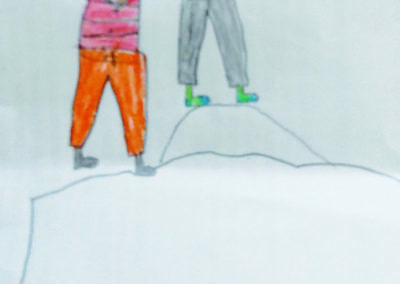 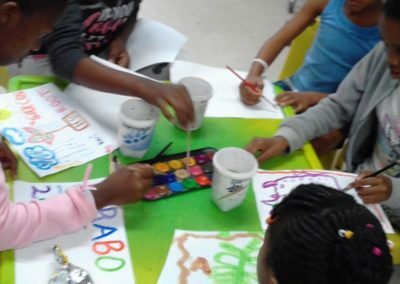 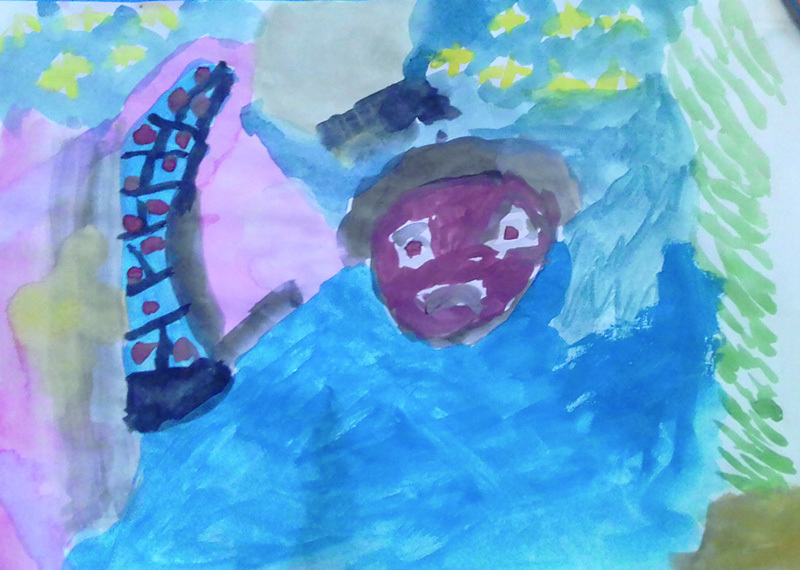 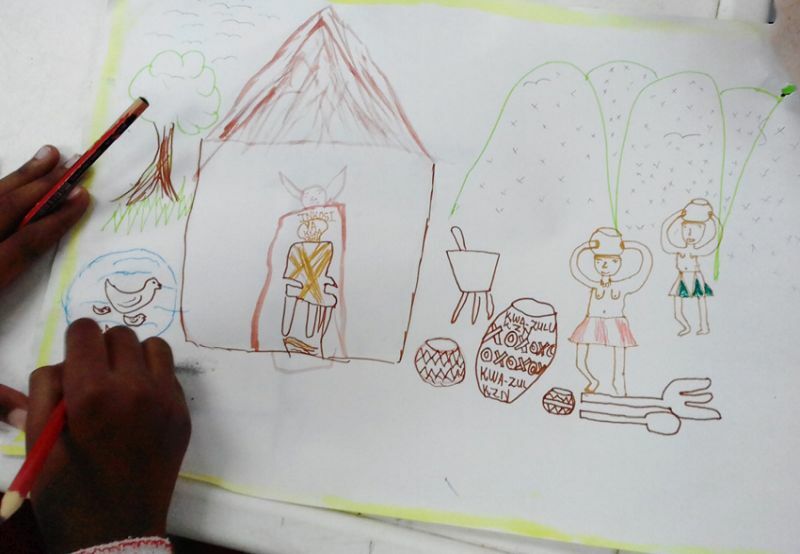 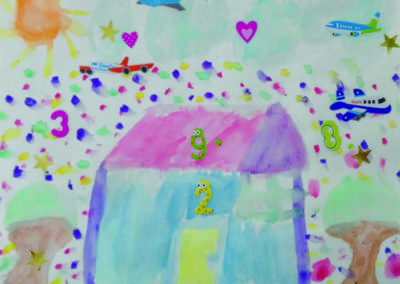 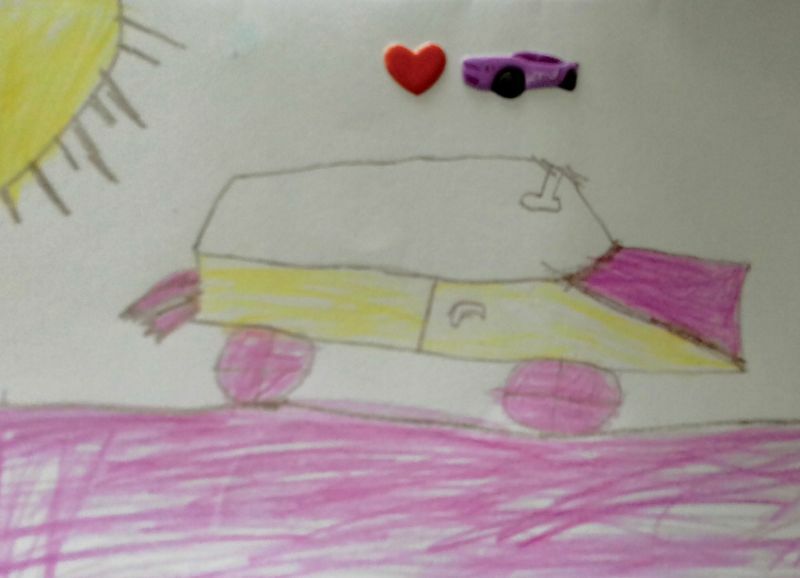 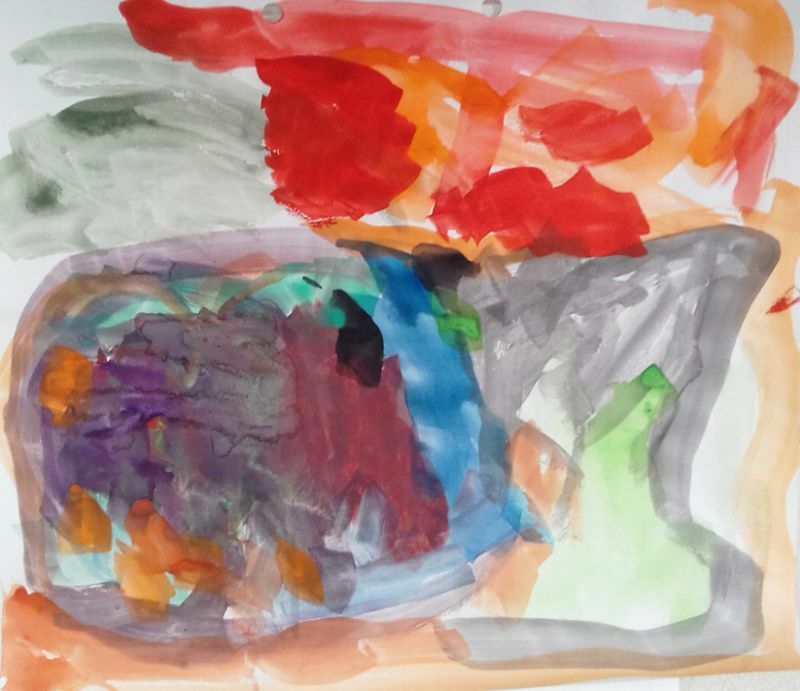 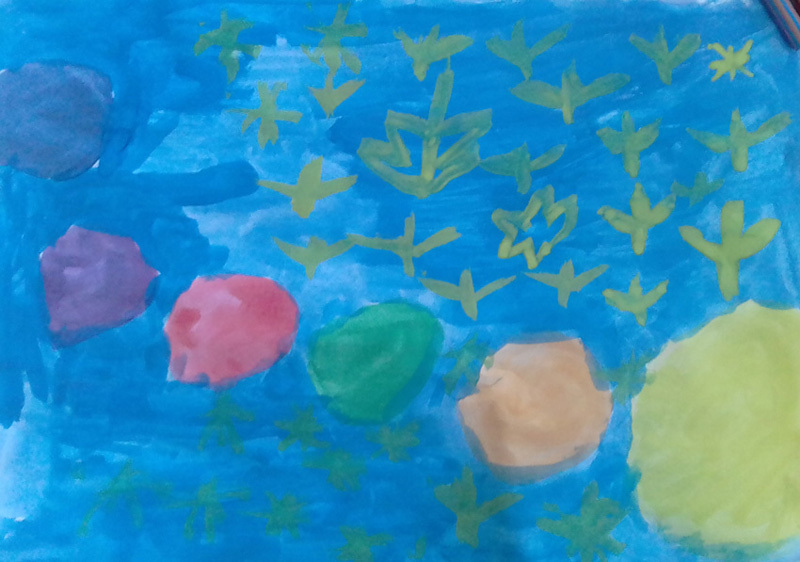 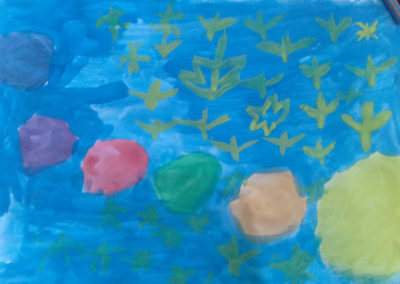 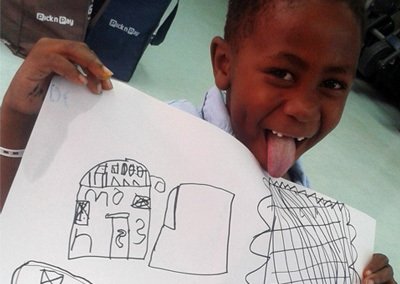 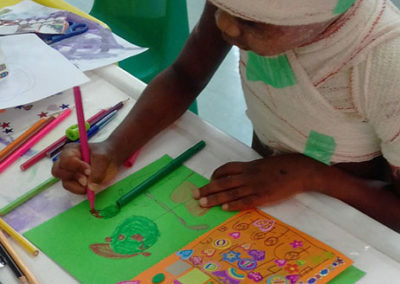 Drawing and painting continues to help children heal emotionally from difficult experiences. The children range in age from toddler to 17 years old. 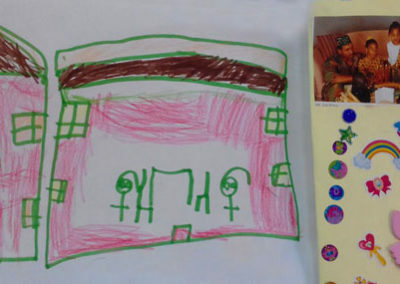 A common drawing theme for girls and boys, is a house. 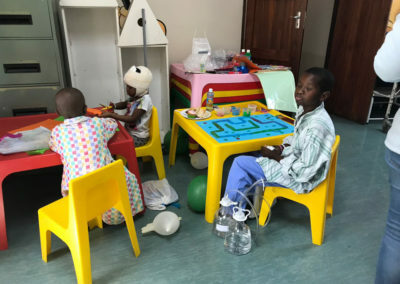 The children miss their homes while in hospital. 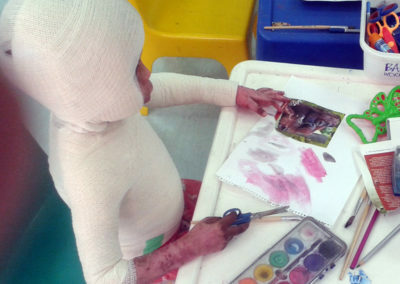 Sometimes their homes have been destroyed by fire. 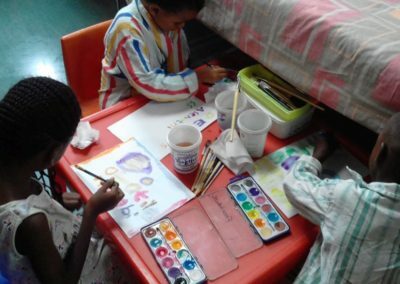 And often they are drawing and painting their future homes. 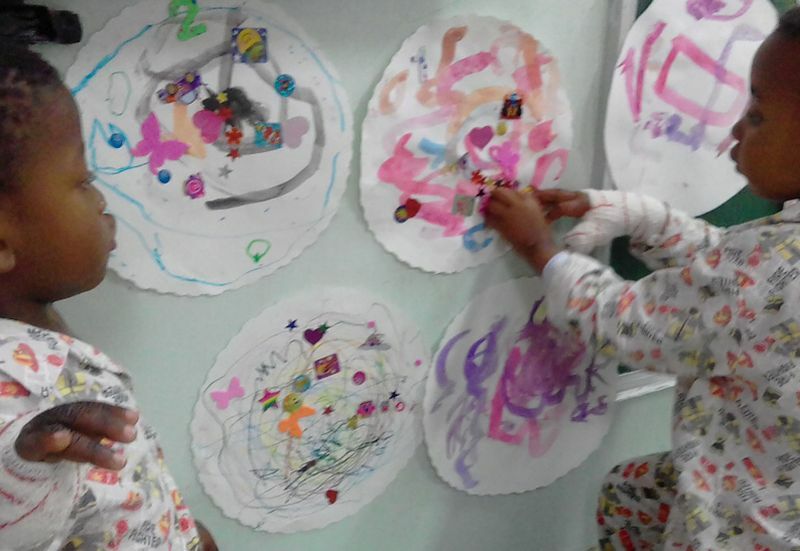 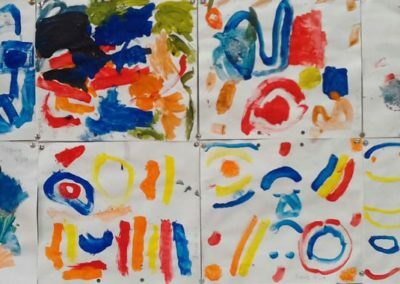 Even though the art is mainly for expression and ability isn’t important, a lot of the children are very talented and get a lot of pleasure and fun out of the hours spent creating their masterpieces. 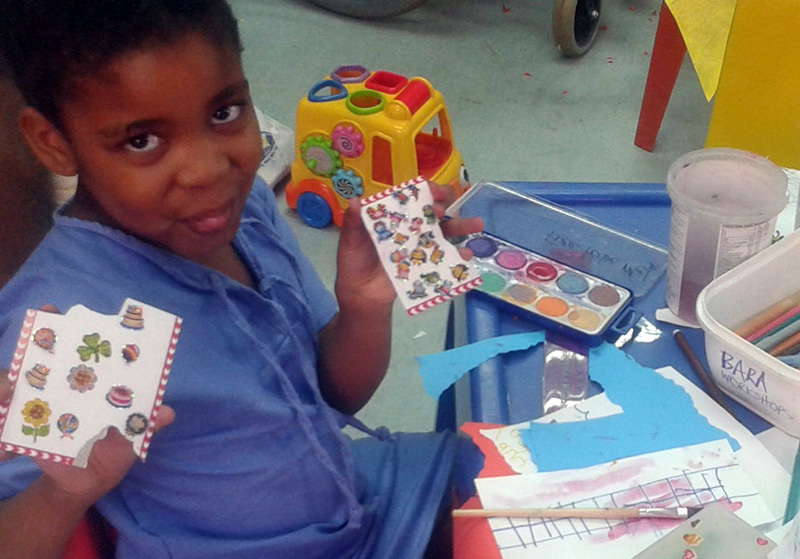 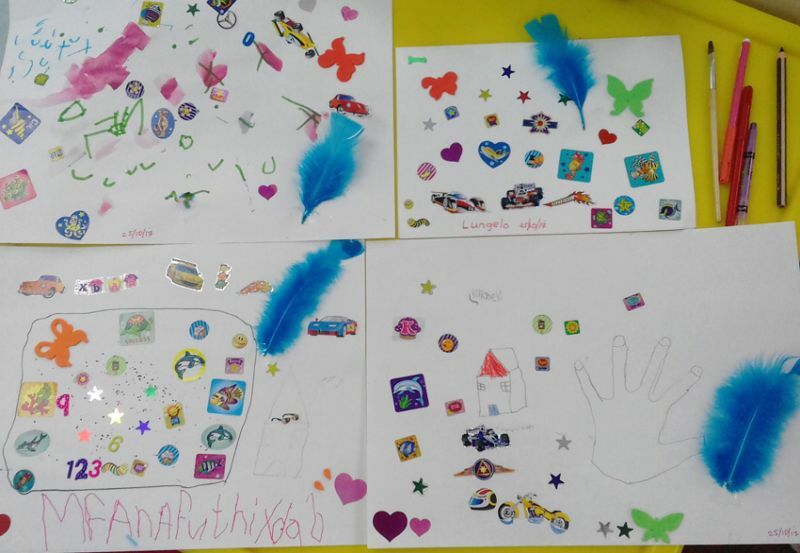 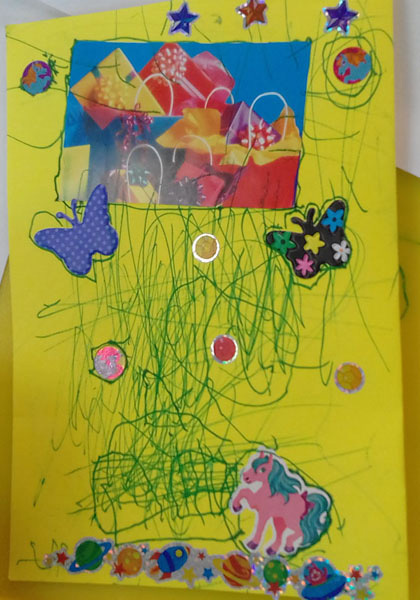 The children love making greeting cards with stickers and drawings too. 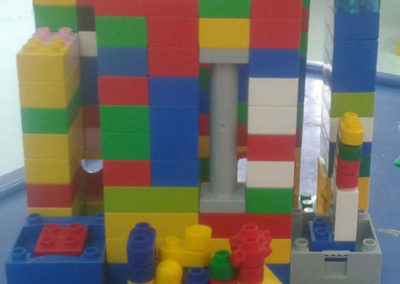 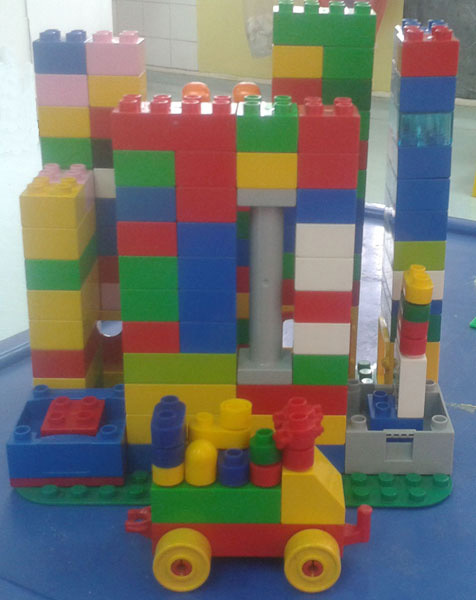 They also love building with Duplo and blocks. 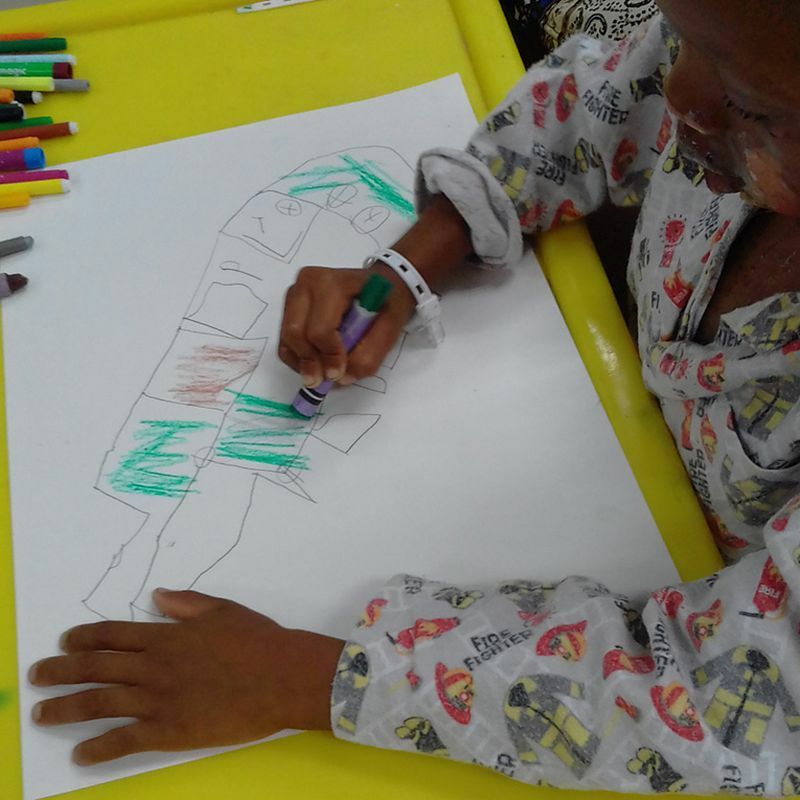 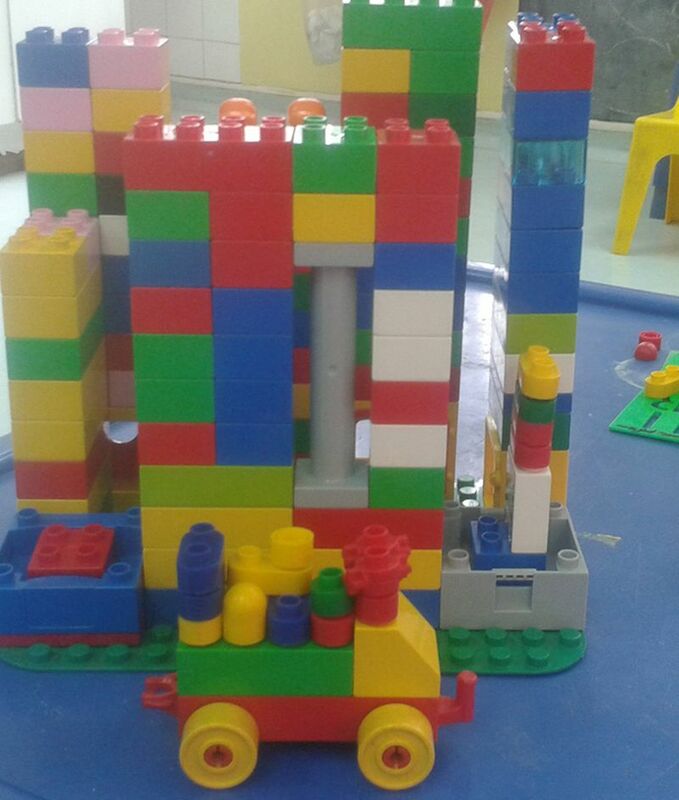 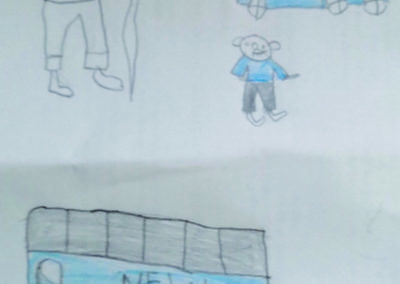 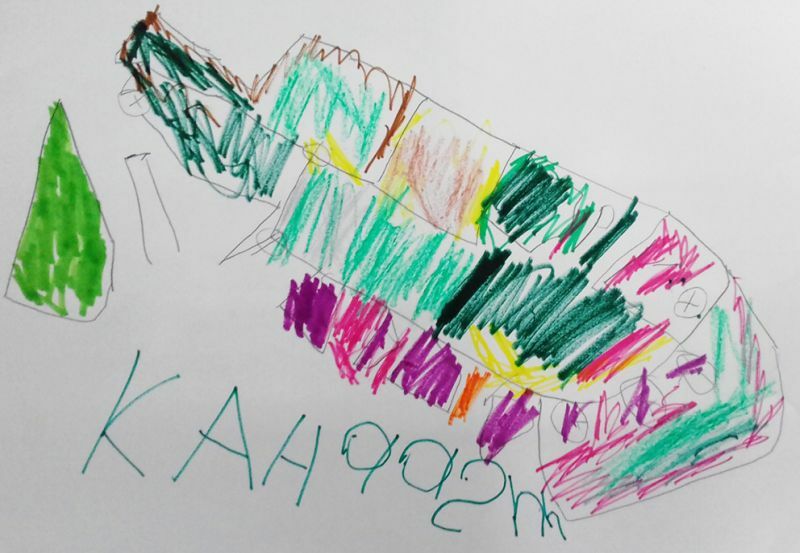 One young 9 year old boy named ‘A’, in last weeks art session in the Orthopaedic ward at the Charlotte Maxeke hospital, was in a wheel chair because his leg has been severed in a train accident. 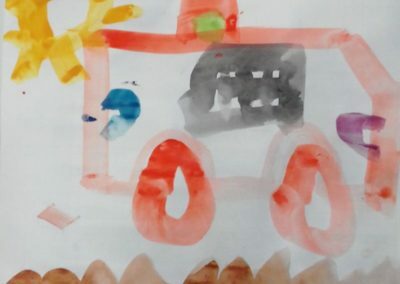 After talking about his traumatic experience and how another young boy pushed him in front of the train, he drew the train and himself lying on the track. 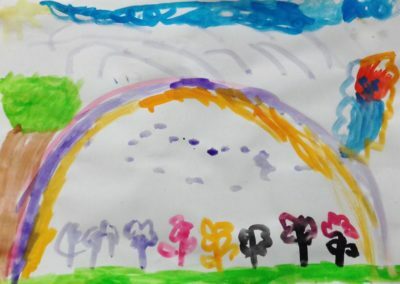 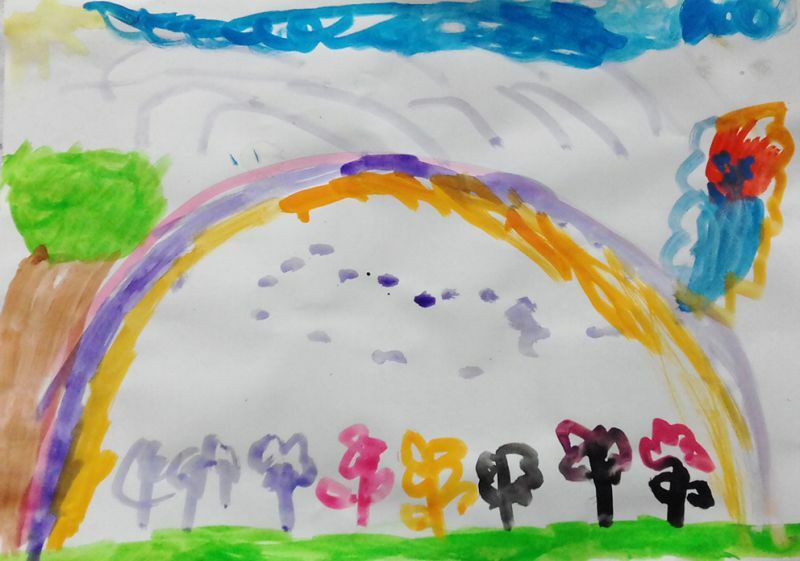 He then drew an new, more positive picture of his home and he spoke about life going forward. 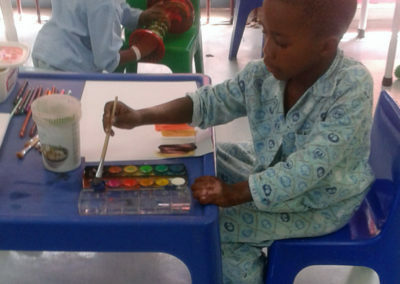 This process helped him to talk more to his mother, who came to visit him a bit later. 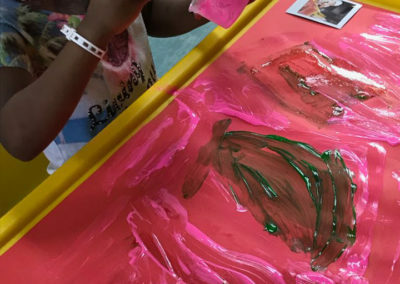 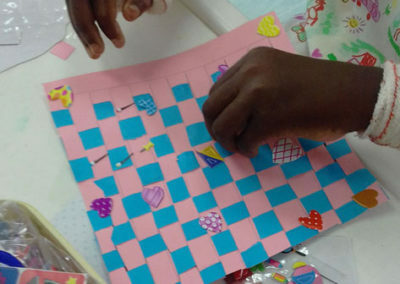 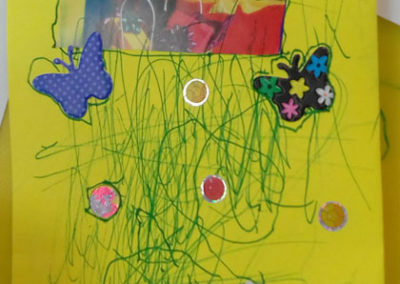 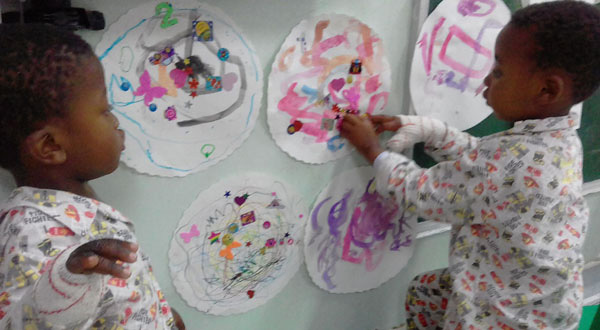 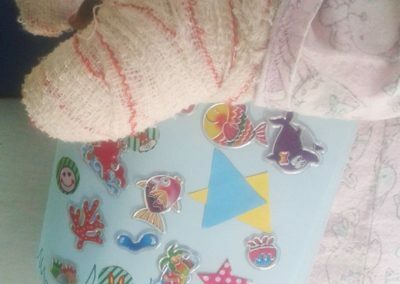 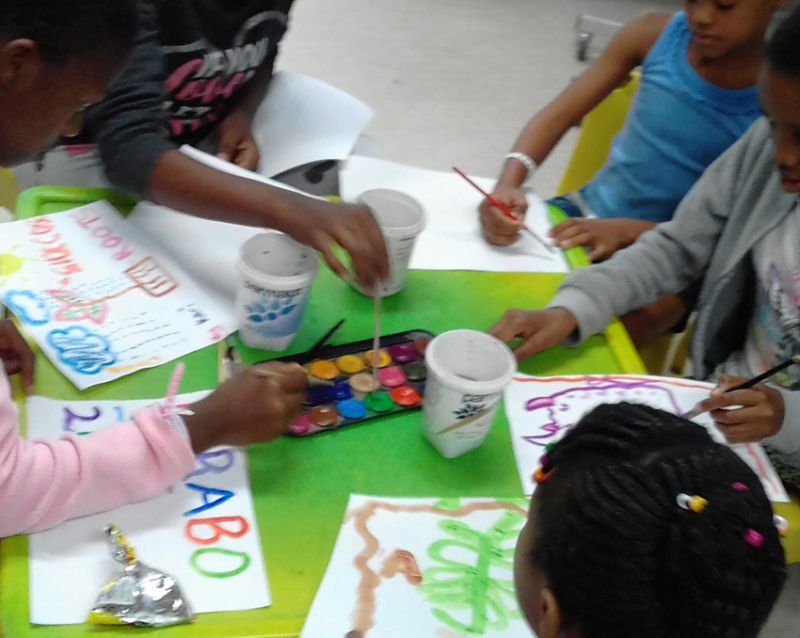 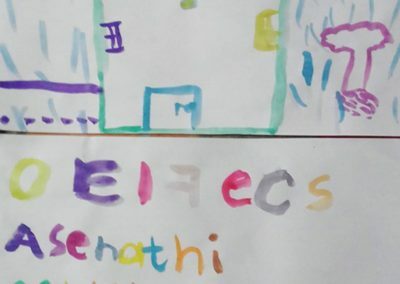 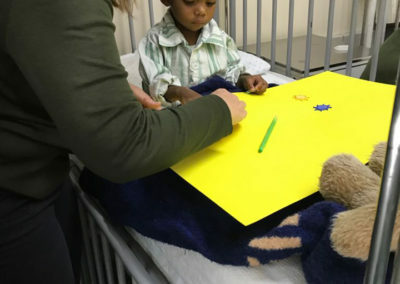 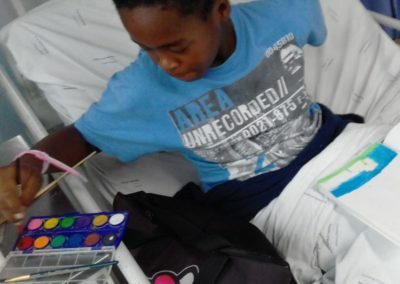 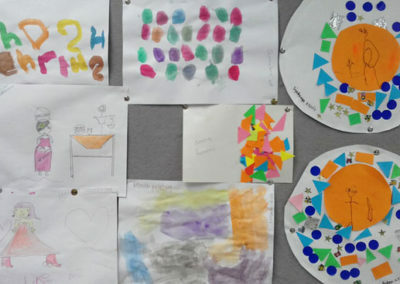 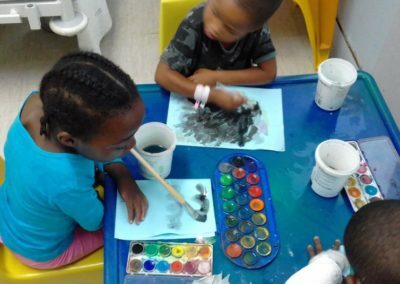 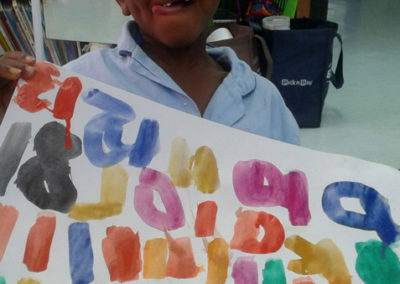 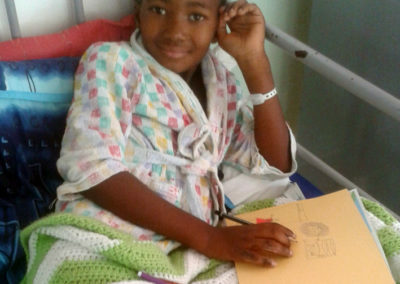 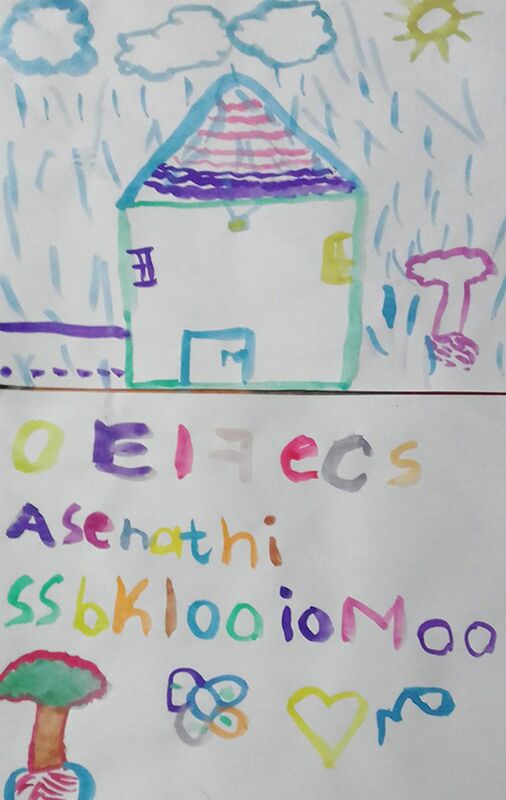 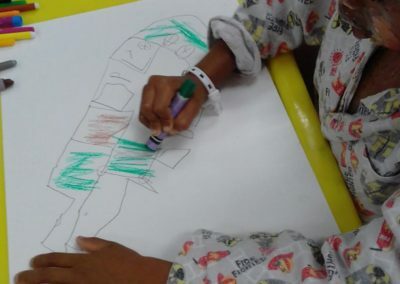 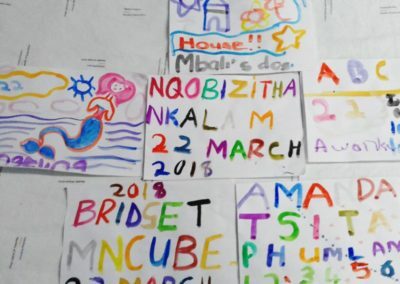 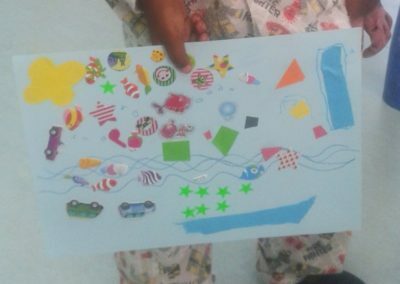 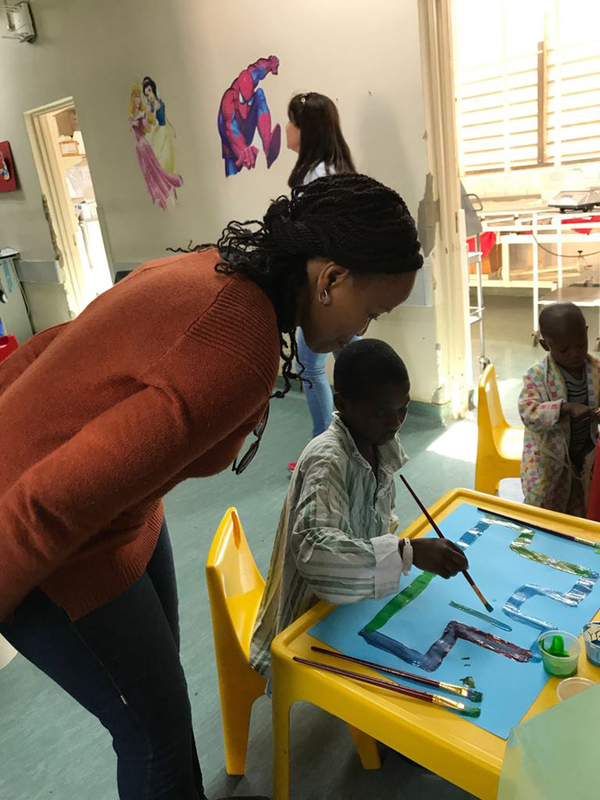 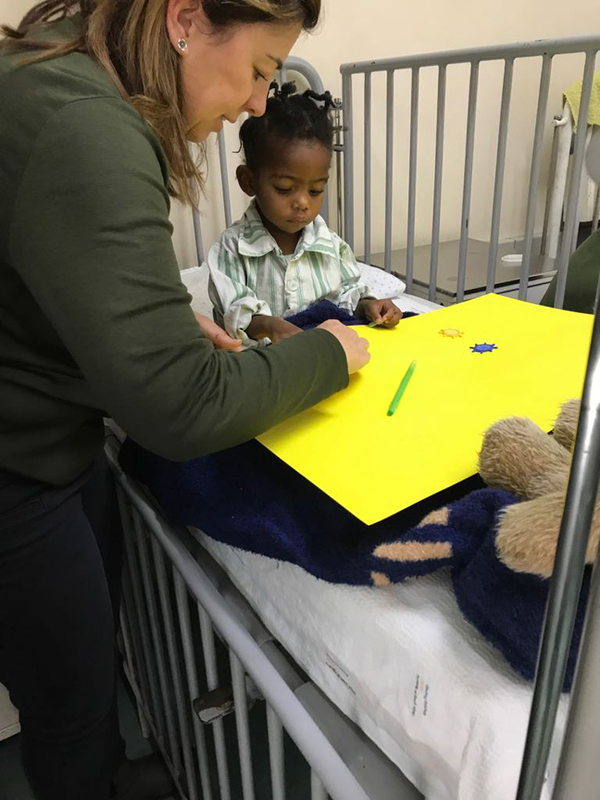 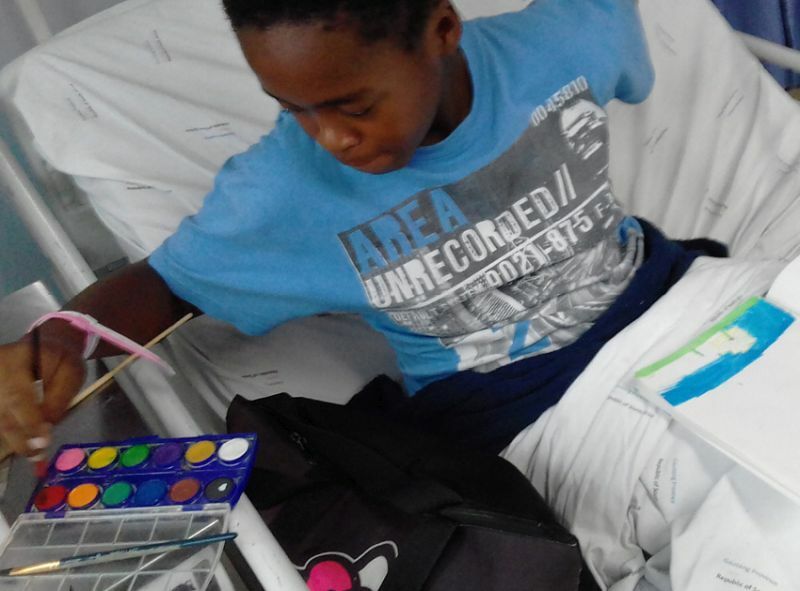 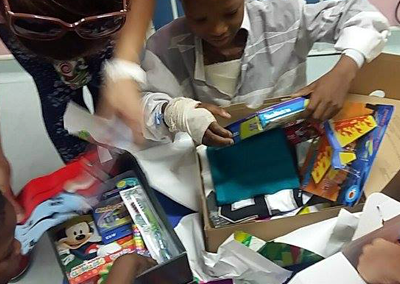 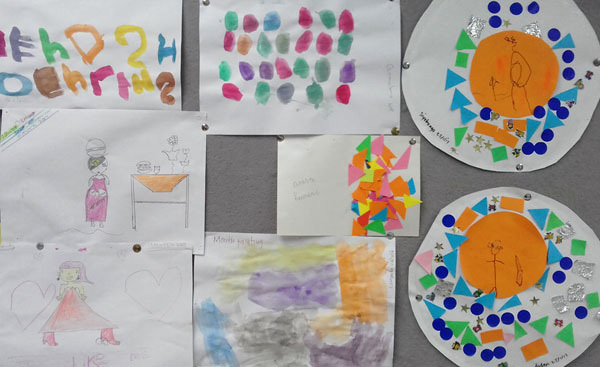 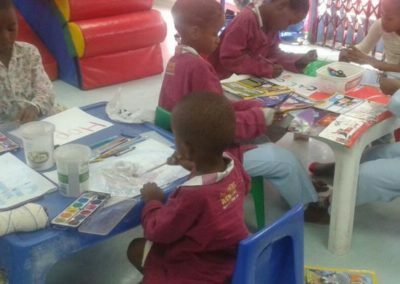 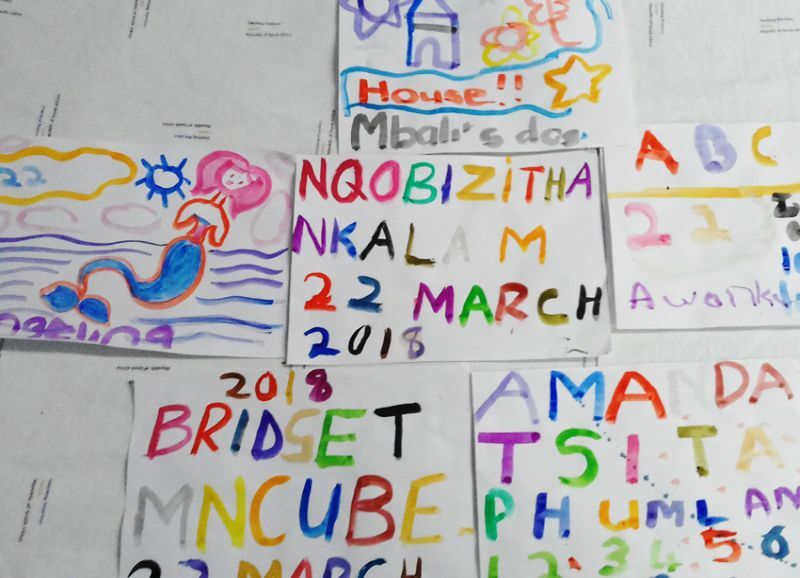 The different wards at the two hospitals differ in size, but most weeks at the Charlotte Maxeke, there can be 16 children and more benefitting from the Expresssive Art sessions. 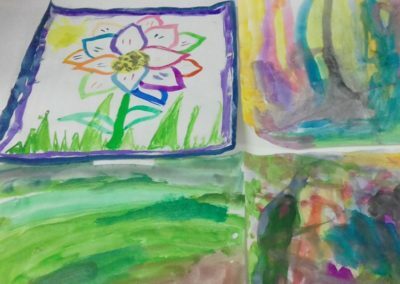 2017 was a wonderful year with Janine Rech as she continues to be our Expressive arts Facilitator. 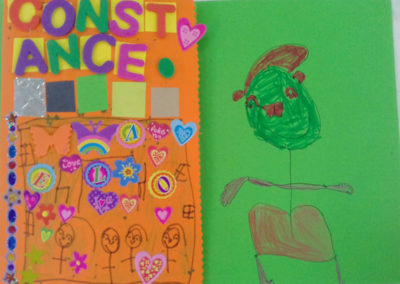 The kids love her and she is just too wonderful!!! 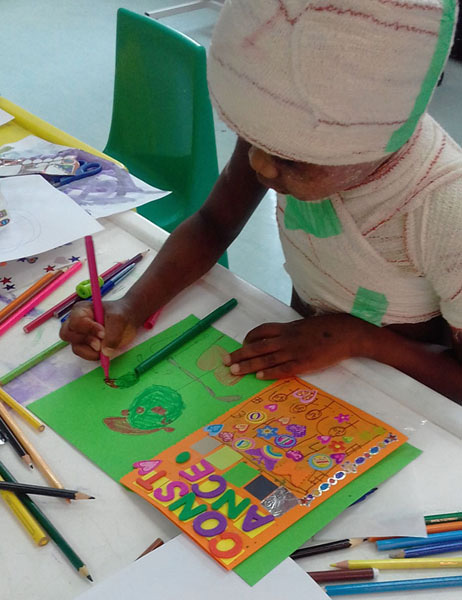 Surgeons for Little Lives would like to thank you ever so much Janine for your contribution and wonderful work thus far, we look forward to yet another wonderful year with you… If you want to volunteer and be a part of our Expressive Art sessions with our Burns patients, please sign up for this volunteer program under the section Get Involved and we will get in touch with you.